CNN, Reports that the quake-damaged Fukushima Daichi nuclear reactor will have to vent its air containment vessels. The internal air pressure levels have risen dangerously to over twice its limit- 2.1 times. The official confirmation of a nuclear disaster at Fakushima Daiichi nuclear plant that just abuts the Coastline at Faukishima prefecture has come in, as New York Times alerts. The roof the nuclear plant had been ripped off by the blast by the more than twice the safe limit of pressure of air inside. 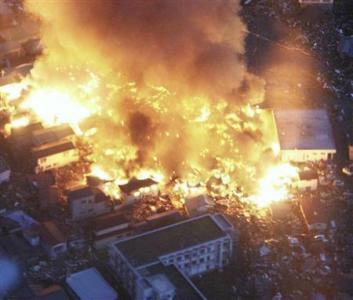 The Reactor had suffered a failure of its Coolant systems being hit by the aftermath of the massive Quake on Friday. The Cabinet secretary Yukio Edano stated, amidst already global concern of a nuclear fallout. Even earlier Japanese television reported detecting Caesium around the site. Television footages showed scary Plant site pictures with an entire wall caving in and leaving just the naked steel spines- while workers were quoted as having seen vapour clouds billowing out. Though officials admitted the seriousness, they allayed fears of a fully fledged nuclear catastrophe. Yet, tests have been telling the control room had registered thousand times above safe limits of radiation and even outside at the gates around ten times. Experts explain the mechanism of failure as due to compulsion of having to shut down the Nuclear Reactors when Japan was hit by Quake. The epicentre being so near, when the Reactor was shut down, the fuel rods which take a long time to cool off, and retain at least 6% of the heat when in use, requiring the continuous operation of the electrically driven pumps that pump in the Coolants water. When power failed they tried diesel generators and when even this failed, the safety valves started venting off the highly pressurised air inside. This air is being said to be not so highly contaminant or radioactive, by the Daichi company that runs the Reactor, built by America’s General Electric. Ultimately they bet on seaward blowing coast winds to carry the radioactive steam. Around 50,000 people were evacuated around the vicinity. American troops and experts are already there, and coolants have been rushed, though attempts at cooling had failed with standby Diesel generators that run the Pumps. As long as the Fuel rods dip inside circulating coolant waters, the cooling will happen eventually and no meltdown will occur. But since as admitted even officially that Coolant system pumps have failed and Pressurised air inside have indeed been released automatically by the valves, and the roof had indeed been blown, whether a nuclear meltdown could still happen when the water levels come down exposing the Uranium rods, had not been so far clarified. Only fresh reports and an investigation could reveal the full extent of what happened at the Fukishimo Reactor when Japan was hit by the quake- a truth that could shake like an aftershock.